The newly designed Sikles Village Trek takes you to the hidden gem of Pokhara. Siklesh villages trek is the best trek to explore the real rural Nepal, its people and life styles. Siklesh village is a large village inhabited by gurung people. There you can see the traditional Nepali houses and Gurung culture. Likewise, you can also enjoy the cultural dances of gurung people in this trek. Siklesh Village trek is a great way to explore the unexplored beauty of Nepal. Sikles Village Trek is a newly designed trekking route of Nepal. This trekking route is less popular and also known as virgin trial of Nepal. Sikles Village is a gurung village located to the north east of Pokhara in the shadow of Annapurna II and Lamjung Himal. This village is known as the second largest gurung village with a well preserved Gurung Culture. The Gurung culture is very preserved in Sikles village. You can encounter the warm hospitality of Gurung people and also can experience their Gurung culture which has still remained intact over the years. The home stays will provide you a typical Nepali taste of living in the villages. Since it is a less popular trial you can expect very few numbers of tourists on the way. You can fully enjoy the trials as there are fewer tourists. This trek offers stunning pictures and many more attractions on the way. The trial passes through villages where you can get glimpses of village life style which is much more different than yours. You can explore the local foods and also buy the handicrafts made by the local villagers. Silkes Village Trek is a great idea to explore the hidden gem of the Pokhara. Sikles Village Trek can be done throughout the year. But, the best time to travel to Sikles village is during Mid September to May. This season provides the best view, favorable weather and you can see the blooming rhododendrons throughout all your ways. Moreover, to have the best trekking experience it is better if you avoid trekking in rainy seasons. The first day of our Sikles Village Trek starts with a long drive to Pokhara. We will have our breakfast at Kathmandu and drive towards Pokhara. The drive to Pokhara is scenic. We will drive through the snake like roads of Prithivi Highway. On the way we will also see some religious sites and major touristic destinations. Pokhara is a major touristic hub of Nepal full of natural beauty. 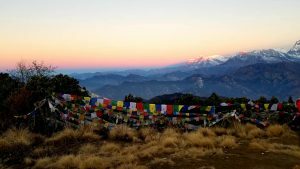 It is a major stop for every trek around Annapurna Region. Overnight at Pokhara. Today we will be trekking to Lama Chaur. Right after our breakfast we start our trial. The trial passes through local villages and fields heading towards Mardi Khola. On our way we will then cross Bhaise and Nawaldanda and then reach to Lama Chaur. It is about 5 hrs walk today. Lama chaur is a beautiful small village. You can see the green hills surrounding this village. Overnight at Lamachaur. After having our breakfast at Sikles we trek forward to Forest Camp. Most of our trials today go through dense forest of Rhododendron, Oak and Pine trees. The trial goes uphill and downhill until we reach to a flat surface surrounded by forests which is Forest Camp. Overnight at Forest Camp. We will have our breakfast at Forest Camp and then start our trial. We will be heading towards Ghale Gaon today. Walking through a trial that goes through forests blanketed with rhododendron trees and meadows, we will cross some small settlements on the way. The trial mostly goes downhill today. After a few descents we will reach Ghale Gaon. Ghale Gaon is a small village where majority of people are gurung and magars. Overnight at Ghale Gaon. Today is the final day of our trek. We will have our breakfast at Ghale Gaon and then trek towards Hyanja. It takes about 4 to 5 hours to reach to Hyanja from Ghale Gaon. From Hyanja we will take a vechicle and drive back to Pokhara which takes about one hour. Overnight at Pokhara. The Sikles Village Trek ends here. Today we will drive back to Kathmandu following the same route. Upon reaching Kathmandu our representatives will drop you to your respective hotel or you can also extend your tour if you want.